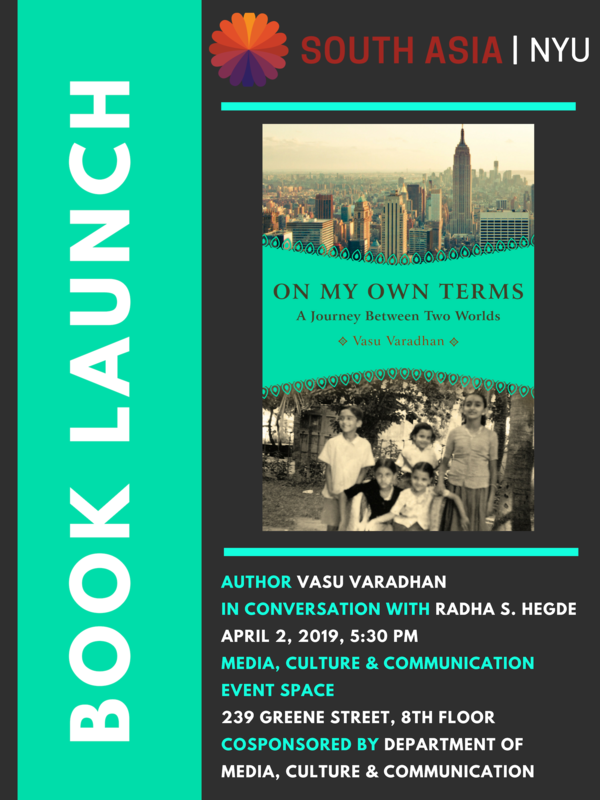 Join us for a book launch of Vasu Varadhan’s new memoir on April 2. The book chronicles an immigrant’s struggle to forge an identity amidst the upheavals of geographical and cultural displacement. The author will read selections and engage in a conversation about the book with Radha S. Hegde. In moments of quiet despair following the death of her eldest son in the September 11 attack on The World Trade Center, Vasu Varadhan thought of her mother and father, a United Nations diplomat and champion of nuclear disarmament during the Cold War who died at the early age of 50; her childhood in New York City and young adulthood in India, and her arranged marriage at the age of 16. Circling back into personal family history led to her decision to write this memoir, a search for better understanding of life’s joys and sorrows. At its core, On My Own Terms is a classic story of an immigrant’s struggle to forge an identity of one’s own amidst the upheavals of geographical and cultural displacement. On another level, it is an homage to a remarkable woman’s struggle to maintain individuality, integrity and freedom as an accomplished scholar inside the orthodox Hindu culture in which she was born and raised. Vasu Varadhan holds a PhD in Media Studies from New York University where she is currently a member of the faculty at the Gallatin School of Individualized Study. She has taught a wide range of interdisciplinary seminars on media theory, identity in a multi-cultural world, ancient Indian literature and South Asian literature with a special focus on emerging Indian writers in the diaspora. She is the featured subject of the documentary, Knowing Her Place, by Indu Krishnan which chronicles her struggle with “cultural schizophrenia” as an Indian American woman searching to forge her own identity. Her writing has been published in two of India’s leading newspapers, The Hindu and The Indian Express, in the South Asian Review and in the online publication, The Pythians. She lives in New York City.